This is not a cheap copy, Hiqh Quality Carger - CE Approved. DS Lite (NDSL), check pin before buying. Protection & overcharging cut off circuit. Easily power your device through the mains socket. CE APPROVED . LED power indicator. (NOT FOR DS-LITE OR NDSI). NOT FOR OLD YEAR 2001 OR BEFORE MODEL. Current limited, with reverse circuit protection. Protective circuit to prevent overcharging (IC chip). 1 x USB Charging Cable. The colors may be a little difference for the different monitor display. 3 pin UK Plug. Short Circuit/Overload protection. Attractive appearance and ergonomic design. Easily power your device through the mains socket. LED power indicator. Connection: UK 3-pin sockets. (NOT FOR DS-LITE OR NDSI). 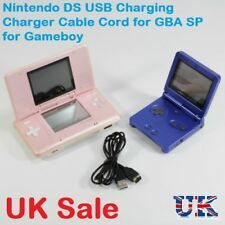 This item is for the GBA SP. 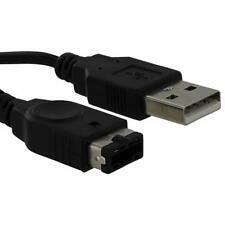 1 X USB Charging Cable For GBA SP. Cable Length: 1.2m (3.94ft). Portable-small & light weight cable, easy to carry. And due to the difference between different monitors, the picture may not reflect the actual color of the item. 1 x USB Power Charging Cable. Best choice for yourself or your friend.You will not be disappointed! Nintendo DS. Nintendo DS Lite. Nintendo Wii. Nintendo Wii U. Nintendo DSi XL. Nintendo 3DS. Nintendo 3DS XL LL. Protection & overcharging cut off circuit. This is a quality robust third party cable. Protection & overcharging cut off circuit. Dry location use only. Easily power your device through the mains socket. LED power indicator. Features: This item is for the Nintend DS, GameBoy, Gameboy Advance, Gameboy Advance SP, GBA SP only. This item is not compatible with Nintend DS Lite or Nintend DSi. Recharge your device in your Car, Home, Office, Bedroom, etc. Fully compatible with your laptop and desktop. Best replacement for the original one. 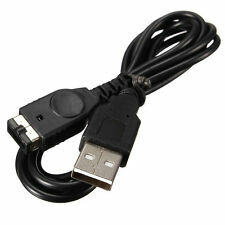 Charger your device with a PC or Laptop with our High Quality premium data cable.. This item is not compatible with Nintend DS Lite or Nintend DSi. Protective circuit to prevent overcharging (IC chip). Current limited, with reverse circuit protection. Pocket sized, lightweight, durable! Genuine Nintendo item! Tested and in perfect working order! This item is not compatible with Nintendo DS Lite or Nintendo DSi. Current limited, with reverse circuit protection. Protective circuit to prevent overcharging (IC chip). The star-scores are very important to us. Material: Copper Wire PVC. 1 Piece Charging Cable. - Protective circuit to prevent overcharging. - Length: Approx. Current limited, with reverse circuit protection. 1Piece Charging Cable. - Size: 1.2m/4ft. This item is for the Nintendo DS,GBA SP. 1 x GBA SP Charging Cable. This item is not compatible with Nintendo DS Lite or Nintendo DSi. Note: Light shooting and different displays may cause the color of the item in the picture a little different from the real thing. CE Approved safe to use. LED indicator light. Risk of electric shock. Dry location use only. Short Circuit/Overload protection. WIll also fit the original DS (the chunky one) but not the DS Lite or later. 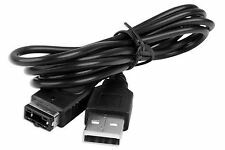 1.100% brand new and high quality cable 2.This item is for the Nintendo DS,GBA SP 3.This item is not compatible with Nintendo DS Lite or Nintendo DSi. 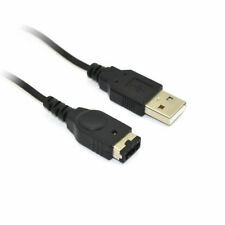 4.USB Power charge,can not use to transfer data 5.Length:1.2m/3.9ft Color:Black. Material:PVC Package Contents:1 x GBA SP Charging Cable Note: Light shooting and different displays may cause the color of the item in the picture a little different from the real thing. CE Approved. Protection & overcharging cut off circuit. Protection & overcharging cut off circuit. Nintendo Wii. 1 YEAR WARRANTY. Nintendo 3DS XL LL. Nintendo 3DS. Nintendo DSi XL. GENUINE OFFICIAL NINTENDO GAME BOY ADVANCE SP / DS UK CHARGER AC POWER ADAPTER. Condition is Used. Dispatched with Royal Mail 1st Class. Protective circuit to prevent overcharging (IC chip). - Device can be used while charging. 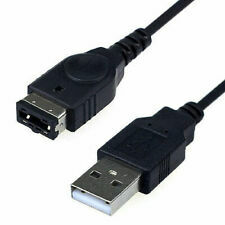 - Cable Length: 120 cm. We will reply you ASAP. Features:This item is for the Nintend DS, GameBoy, Gameboy Advance, Gameboy Advance SP, GBA SP only.This item is not compatible with Nintend DS Lite or Nintend DSi.Recharge your device in your Car, Home, Office, Bedroom, etc.Fully compatible with your laptop and desktop. Best replacement for the original one. Charger your device with a PC or Laptop with our High Quality premium data cable.Protective circuit to prevent overcharging&nbs. Features: Specially Designed-Compatible with Nintend NDS/GBASP controller and Console. Anti-swing, Anti-drag for longer service life. Specification: Type: US Color: Black material: plastic Package Includes: 1 x AC Wall Charger Brand Unbranded MPN Does not apply EAN Does not apply ISBN Does Not Apply. This item is for the GBA SP. 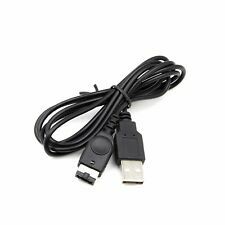 1 X USB Charging Cable For GBA SP. Cable Length: 1.2m (3.94ft). Portable-small & light weight cable, easy to carry. Due to the difference between different monitors, the picture may not reflect the actual color of the item. DS Lite, check pin before buying. Protection & overcharging cut off circuit.